Posted July 13, 2014 & filed under In the News. 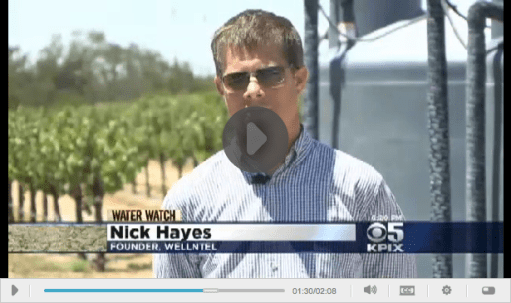 Sue Luft, Wellntel pilot program participant and founder of Pro Water Equity, and Nick Hayes, CTO of Wellntel, were interviewed by the KPIX 6 o’clock news about the importance of groundwater information to people who depend on private wells, like homeowners, ranchers, farmers and growers. Read more about Wellntel’s Paso Robles Pilot program here.